There are many occasions that require a suit to be worn, with some more formal than others; royal events, in particular, demand a certain type of etiquette. Royal Ascot is one of the most popular royal events of the year, and it is an event that gives people the chance to dress to impress. Looking good at Ascot is essential and people often plan their outfit months in advance of the meeting. Attending arguably the world biggest horse-racing meeting and being in the presence of royalty means that a special suit is required; in this case, the dress is morning dress. A morning suit is not one suited to all occasions, and it will generally be reserved for selected formal events, for this reason many people opt for Royal Ascot suit hire over going out and buying. 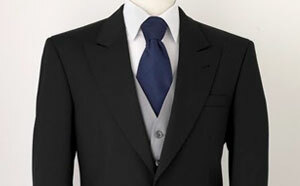 Unlike most formal events, Royal Ascot suit hire only gives the customer limited choice in what they can wear. The common etiquette at such an event in terms of the suit worn will be, a grey or black tailcoat combined with striped or grey trousers, a plain white shirt waistcoat or vest and tie or cravat. The type of tailcoat chosen will determine the trousers that are to be worn. A black tailcoat is worn with striped trousers and a grey coat is paired with matching grey formal trousers. Most people at the event will opt for the black coat, although both outfits are widely available for hire. The plain white shirt will come with a choice of collar: wing or standard. The collar you opt for will depict the neck wear, it is common that a cravat is chosen with a wing collar shirt and tie with standard collar. A waistcoat or vest will match the formal attire and is down to personal preference which one is chosen. The two are very similar with a vest simply being a backless waistcoat. To complete the outfit a person generally opts for a top hat, the colour of the hat should match that of the jacket. Lightweight grey gloves may also be chosen as an added accessory. Royal Ascot suit hire is very popular, particularly close to the summer meeting in June; this will mean booking well in advance to avoid disappointment. A good choice of fabric for your suit will be fine wool. This will allow you to remain cool in soaring temperatures and warm in cool weather, which is so often the case with British summers. When hiring your suit you will have the option to hire from a shop or from an online supplier, the former is the most popular method, although many people are choosing online for the convenience. Royal Ascot suit hire online is beneficial on occasions when it is too difficult to find the time to visit a shop, although it does not give you the chance to have a suit tailored to fit which so many people prefer when hiring a morning suit.